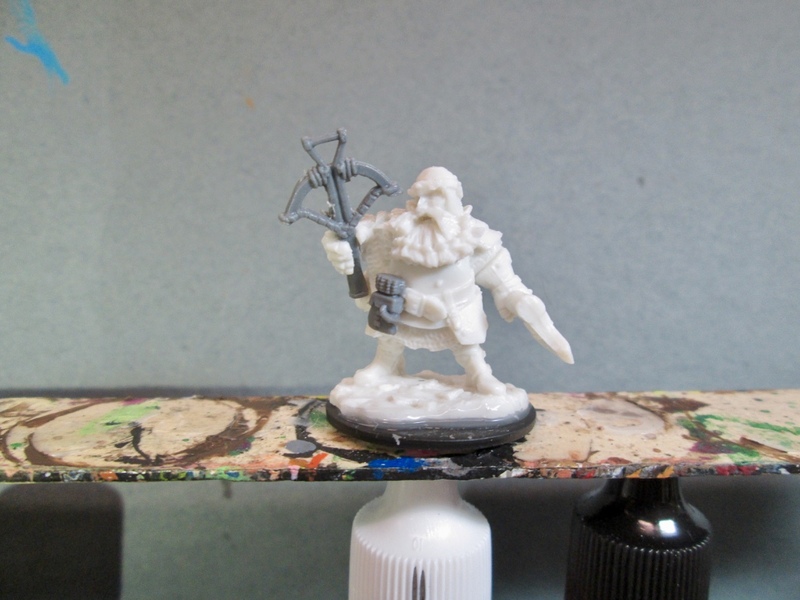 Hagar, Dwarven Hero: Bones 3 Figure, with Crossbow Conversion | H.A.W.K.S. 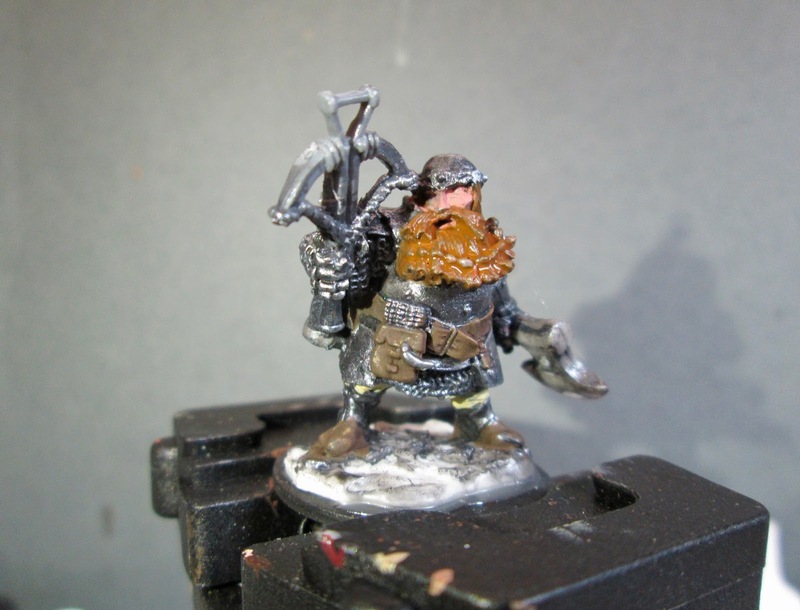 This past week I got back to working on my all-Dwarf warband for Frostgrave, and painted Hagar, Dwarven Hero, from the Bones 3 Dwarves Set. 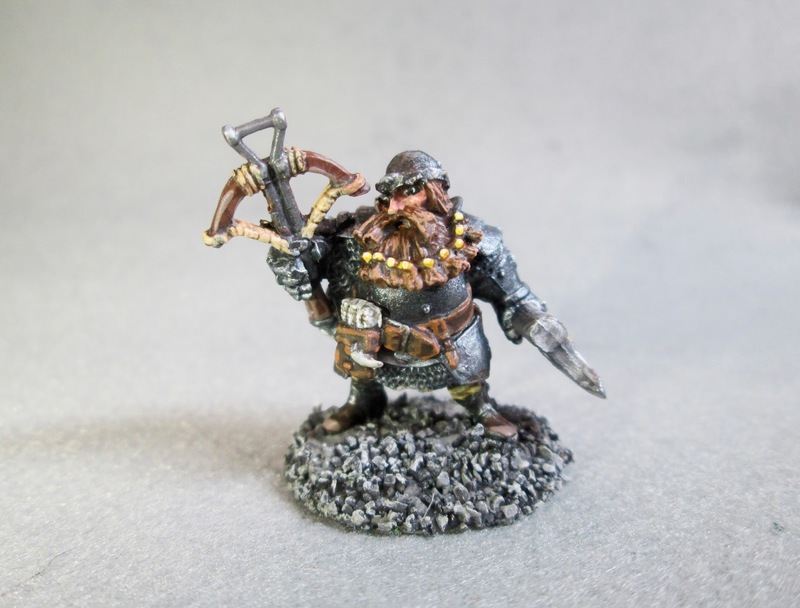 I had converted this figure a while back, as part of a trio of Bones 3 Dwarves I converted for an all-Dwarf warband for Frostgrave, by replacing one of his axes with a crossbow and adding a quiver of bolts, both from the Frostgrave Soldiers plastic figure set from Northstar. Working on the figure in the center this week. 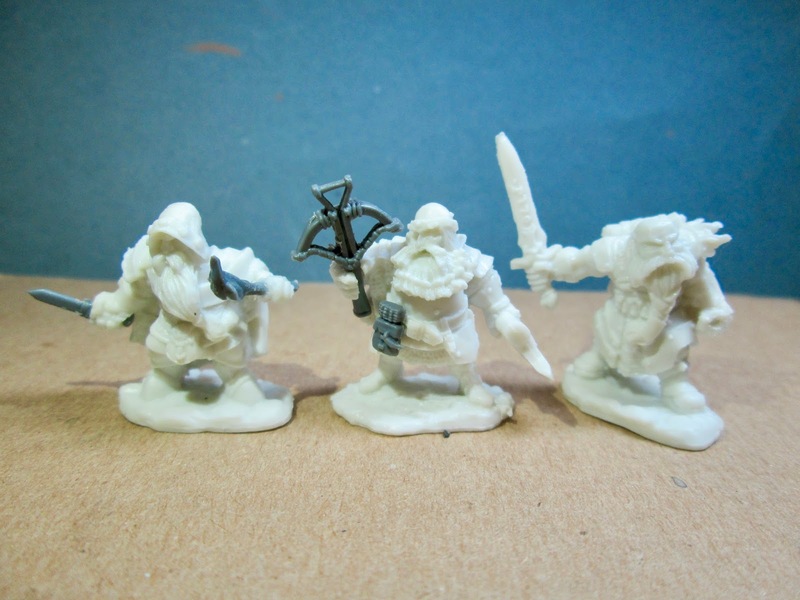 Figure in the center with axe removed, and crossbow and quiver of bolts added. I had originally planned to start working on this figure a while ago, and had glued it to a craft stick, but then it got back-burned for other projects. When I decided to get back to it last week, I popped it off the stick and put it in my painting grip. 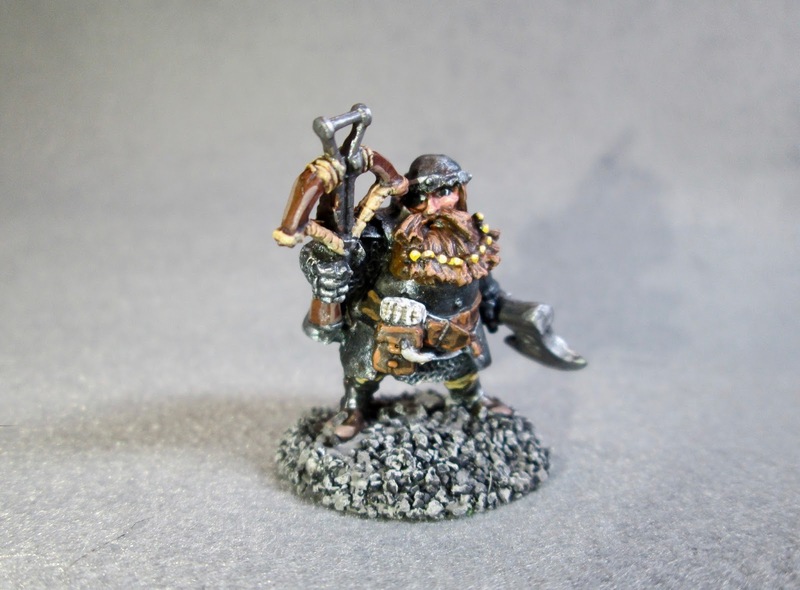 Next, I painted his beard with Reaper MSP “Turkey Brown”, and then did his belts, straps, shoes, and quiver with Americana “Raw Umber”. I also painted the pouch on his back with Ceramcoat “Territorial Beige”, and his pants with Apple Barrel “Apple Maple Syrup”. 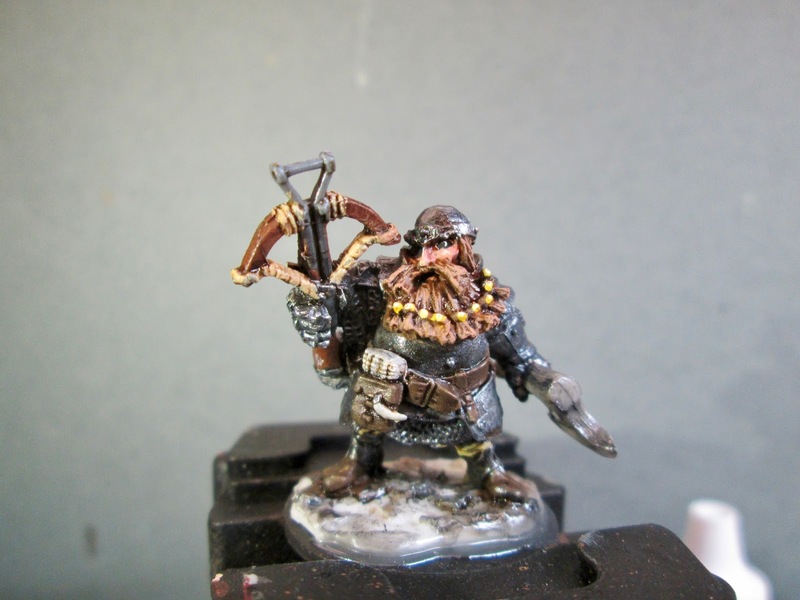 I then painted his crossbow and axe handle, with Crafter’s Acrylic “Cinnamon Brown”, and then painted the crossbow rope with Americana “Antique White”. 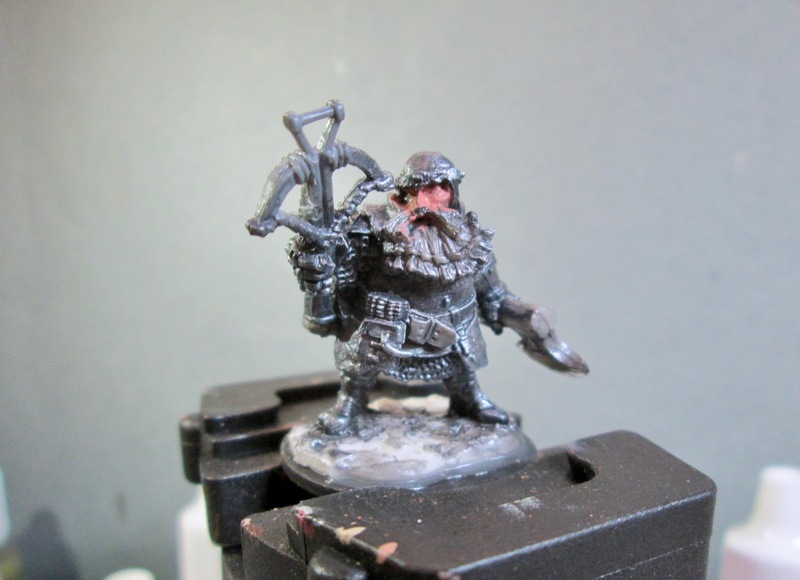 After that, I painted the quarrel fletchings with Americana “Dove Grey”, and the fang(?) on the quiver with Americana “Bleached Sand”. When all that was dry, I gave all the non metallic parts, except for his face, a wash with Citadel “Agrax Earthsahde” wash. I then went back and applied some Citadel “Reikland Fleshshade” wash to his face. When the washes were dry, I highlighted his face with some Crafter’s Acrylic “Flesh” mixed with a little of the Shading Flesh". I then highlighted his beard with Americana “Sable Brown”, and then a little Americana “Khaki Tan”. Next, I painted the beads in his beard, using a base of Apple Barrel “Yellow”, and then highlighting up using, first, Crafter’s Acrylic “Daffodil Yellow”, and then Apple Barrel “Lemon Chiffon”. I first only highlighted alternating beads, as I planned to paint the other ones with gold, but as I looked at the highlighted beads I realized I had achieved something of an unintentional Non-Metallic Metal (NMM) effect unintentionally, so I just went back and highlighted the rest of the beads. Next, I highlighted his belts, straps, and quiver with Americana “Terra Cotta”, and then highlighted the pouch on his back with the “Khaki Tan”. 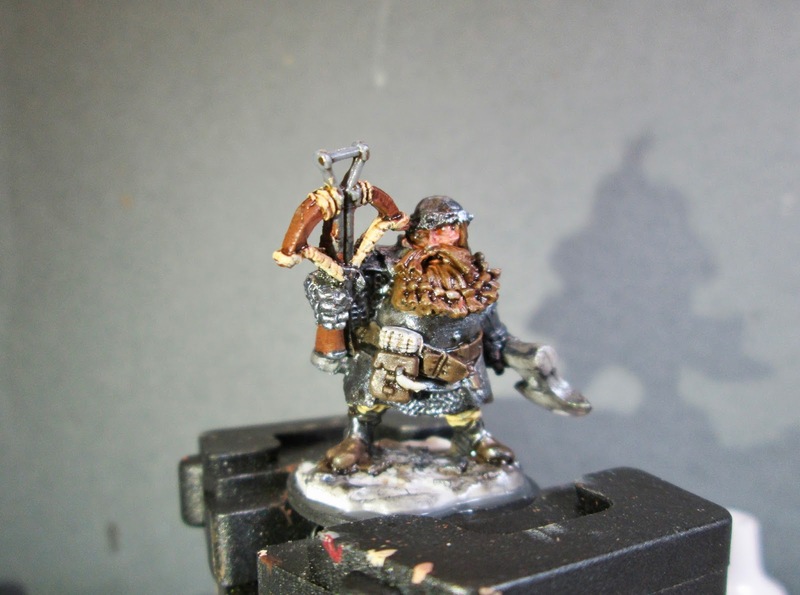 I then highlighted the wood parts of the crossbow, the axe handle, and his shoes with Americana “Mississippi Mud”, and the rope on the crossbow with the “Bleached Sand”. after that, I highlighted the fletchings with White, and the fang(?) with Crafter’s Acrylic “Light Antique White”. 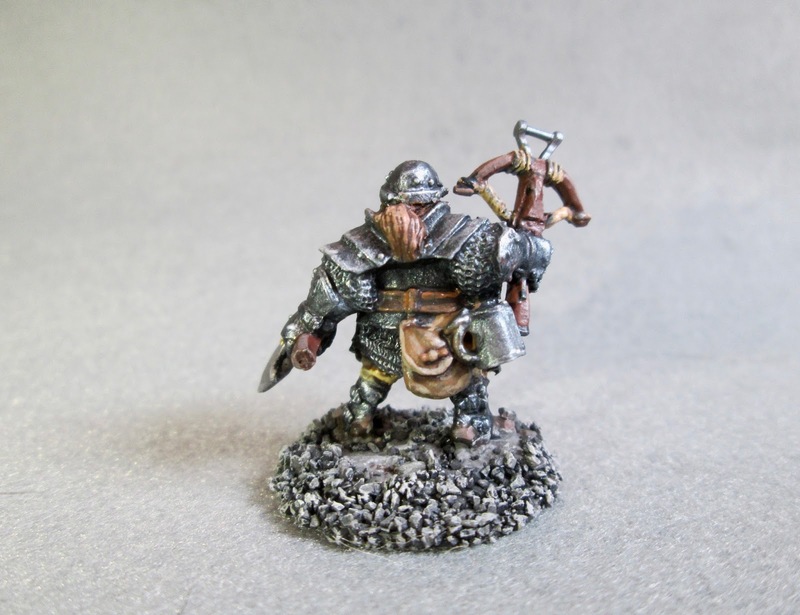 I then turned to the non-armor metal parts; and painted his beer mug with Accent “Princely Pewter”, and the axe head and crossbow fittings with Ceramcoat “Metallic Pewter”. 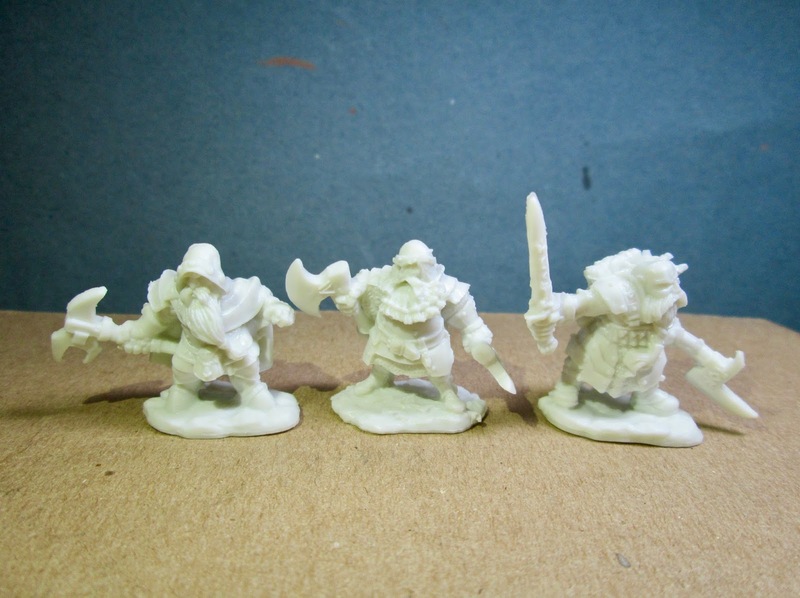 I then went back and highlighted these parts, as well as some of the armor with the “Metallic Silver”. When the Black was dry, I used some white glue to glue a little black course sand onto the base. When this was dry I drybrushed the bases with some of the Americana “Neutral Grey”, and then some of the “Dove Grey”.